Oh, the birds and the bees, the plants and the trees! Beltane is for the birds this year. The Celtic festival of Beltane celebrates the beginning of summer, the lusty attraction of young folks, and the marriage of the King to the Goddess of the Land. The King would only be acceptable to her if he would promise to foster the health and well being of his people. And that would only be possible if he insured the fertility of all the plants and animals of his kingdom. So, this year we celebrated Beltane amidst the lusty May mating of the birds, seeking to foster their health and well being in rich, healthy, and diverse habitat gardens. In the morning three knowledgeable and enthusiastic local Audubon representatives arrived to assess our woodland and gardens as prime habitat for native birds. They walked the land with our inventory in hand seeing the restoration work, the extensive plantings, and our largely successful efforts to remove all (ok, not quite all) the exotic invasives. 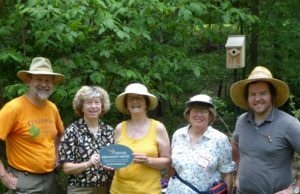 This native plant conservation garden was awarded the highest level certification, platinum, as a bird-friendly habitat garden. In the afternoon friends and neighbors arrived to hear a wonderful presentation by Barbara Driscoll of Audubon on the importance of planting native trees and shrubs to attract the birds we all love to hear singing. Barbara talked about the layers of forest that are critical to support all the insects that the birds need to feed their young, because baby birds can only eat caterpillars and insects. (A nest of five baby chickadees, for example, needs to eat 6,000-9,000 caterpillars!) 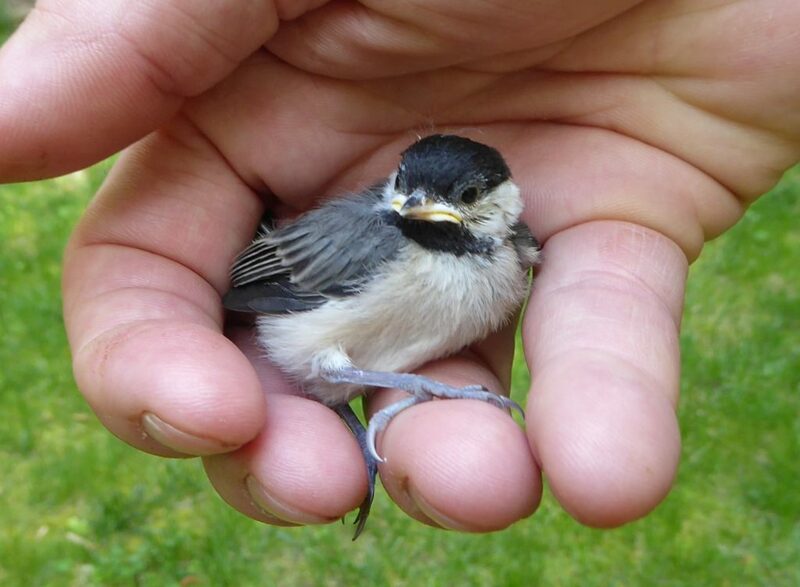 As if on cue a little baby chickadee popped out from its nest in the bird house onto the lawn and was promptly scooped up and put back inside. The large native canopy trees such as oaks are the most important hosts of the necessary insects. Next in importance are the understory trees such as dogwoods and ironwoods. Shrubs such as spicebush and vibernum do their part. Finally, the herbaceous layer of flowers attract the pollinators, like butterflies that contribute the baby caterpillars, and other insects that supply the meals for the baby birds. Participants learned how they, too, could meet the requirements and apply for recognition as bird-friendly habitat. Many bird species are declining because of loss of habitat, so natives added to any garden will help. 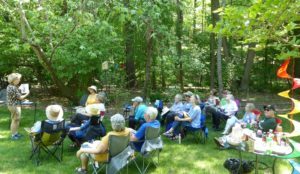 I led a stroll around the garden, pointing out the layers of the forest and examples of the trees, shrubs, and flowers that Barbara had talked about. I put in a plug in for the mosses, too, as chickadees make their nests almost entirely of moss. We offered copies of an article that had appeared on the internet recently on how watching birds near our homes is good for our health. This event was timed to coincide with the Botanical Garden’s Spring Native Plant Sale the following weekend. Then the Bolin Creek String Band arrived and managed to play two tunes before the sky suddenly darkened, there was a loud clap of thunder, and a downpour ensued. Taken by surprise and not knowing how long it would last, since it wasn’t predicted in the first place, people ran to their cars and peeled away. 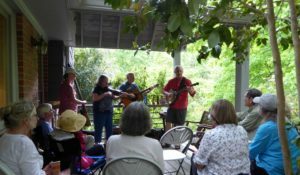 The band, however, flew up to our small front porch, gamely set back up, and played their full program of lively and often humorous old-time Appalachian music for the great enjoyment of the ten or so of us that remained. We all admired such flexibility! Donations to this event were gladly accepted to benefit our local Audubon society for their much needed work in promoting gardening that benefits not only the birds, but also our whole remaining piedmont ecosystem. 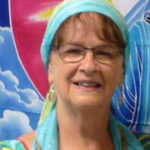 Barbara, perhaps someday we will get to do gatherings with you again. Thank you so much, Betty Lou, for hosting this memorable garden gathering in your and David’s beautiful nature sanctuary. Your love for the land and our native plants shows in the great care you have put into maintaining and restoring this rich bottomland with its gorgeous tree canopy, augmented with plantings at understory, shrub, and herbaceous levels. That chickadee family has a bounteous home! I also felt welcomed by the warmth of your hospitality and the goodness of the companionship. Thank you, too, on behalf of Audubon, for your and others’ gifts to the cause of birds and wildlife. Barb, 2018 being the Year of the Bird, this was the least we could do to honor the winged ones. I, too, was grateful for the generous donations our guests made to benefit the work of Audubon. Thanks, too, Barb, for all your work on behalf of both birds and the native plants they depend on.